NASA managers reviewing the progress of repairs to the shuttle Discovery's external tank and the rationale for making another launch attempt decided Wednesday to pass up an early December launch window, delaying the flight to at least Dec. 17 and possibly all the way to February, sources said. A news conference with Bill Gerstenmaier, director of space operations at NASA headquarters, and John Shannon, the shuttle program manager at the Johnson Space Center, was scheduled for 3 p.m. EST to discuss Discovery's launch status. In the meantime, sources said, the Dec. 17 "no-earlier-than" date is little more than a planning target at this point, the first day a launch would be possible following a Russian Soyuz launch and docking Dec. 15 and 17 respectively. Even if the tank is cleared for launch by then, mission managers would have to remove several hundred pounds of cargo because of a variety of technical factors, including the density of the winter atmosphere and its effects on the shuttle's ascent performance. They also would have to buy into having a shuttle mission underway over the Christmas holidays. If Discovery remains grounded through December, the flight would slip to February because of conflicts with other unmanned cargo launches and temperature constraints related to the station's orbit. The next official launch window opens Feb. 27. But it may be possible to launch Discovery in early February if a Japanese cargo ship, scheduled to arrive in late January, can be moved to another port on the space station. A key element of the "flight rationale" discussion is an understanding of what caused cracks in vertical ribs, or stringers, spotted after a Nov. 5 launch scrub and whether they represent a generic problem that poses a broader threat. While there are several theories, engineers have not yet identified the root cause. Cracks became more common after the 1998 debut of new super lightweight tanks built with a more brittle aluminum-lithium alloy. Since then, 29 cracks in stringers making up the ribbed "intertank" section that separates liquid hydrogen and oxygen tanks have been found and repaired in 18 external tanks, including Discovery's and a tank scheduled for use by the shuttle Atlantis next summer. The problem with Discovery's tank was spotted after a gaseous hydrogen leak in a vent line attachment fitting forced a launch scrub Dec. 5. During de-tanking operations, engineers spotted a large crack in the foam insulation of the intertank flange area near the base of the upper liquid oxygen tank. 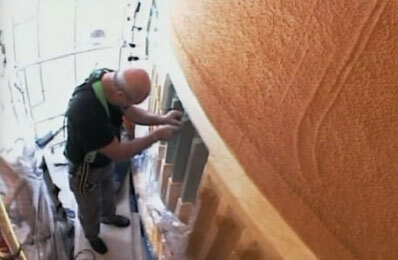 When the insulation was cut away for repairs, four cracks in two underlying stringers were found. Using a known repair technique, the damaged stringer sections were cut out and replacements were spliced in, along with "doublers" to provide additional strength. Fresh BX foam then was sprayed on and shaped to blend in with the surrounding insulation. Working in parallel, engineers also replaced the hydrogen vent line quick-disconnect fitting after tracing the leak to a misalignment issue. A suspect circuit breaker believed to be responsible for a subtle electrical problem that led to an earlier launch delay also was replaced. But before Discovery can be cleared for launch, engineers must show that any additional cracks that might form in the tank stringers after the shuttle is re-fueled won't cause foam to pop off while the shuttle is climbing out of the dense lower atmosphere. During the first two minutes or so of flight, the density of the atmosphere is still high enough to quickly slow lightweight foam debris, allowing the rapidly accelerating shuttle to fly into it at a high relative velocity. At a more fundamental level, the crack issue raises questions about the overall structural integrity of the tank and the ability of weakened stringers to handle the forces experienced during launch. The stringers are not considered load-bearing components, but engineers need to verify the tank's safety margins. Whether cracks in the aluminum-lithium ribs represent a generic problem remains to be seen. It is possible, engineers say, that shuttles have been flying with undetected cracks for years. "The immediate reaction is, have we been getting these all along on super lightweight tanks? And the answer's 'probably,' depending on what's causing it," a NASA engineer who asked not to be named said Tuesday. "And the fact that they found more cracks on this tank does suggest that it's a generic flaw. But if it really is superficial cracks that don't affect the stiffness, don't affect load-carrying capability, then it really doesn't matter." However the discussion plays out, NASA's options are limited. The agency only plans three more missions: Discovery's, a flight by Endeavour at the end of February and a final flight by Atlantis next summer. There are no spare tanks and little time to make major changes. Even so, shuttle managers have repeatedly said they will not be driven by schedule pressure and that Discovery will only be launched if the community agrees it is safe to do so. "They're doing a very, very good, honest job of pulling the data in," the NASA engineer said. The year's final shuttle launch window opens Nov. 29 and closes Dec. 6, the last day Discovery could take off and finish its space station resupply mission before the planned docking of a Russian Soyuz capsule Dec. 17 carrying three fresh crew members. NASA managers announced last week that tank repairs and inspections would delay another attempt to launch Discovery until at least Dec. 3. With the Dec. 3-6 launch window now off the table, planners are looking into the possibility of launching Discovery after the Soyuz docking, resulting a fight over the Christmas holidays. One major issue facing NASA planners is the health of the U.S. oxygen generation system aboard the International Space Station. The system currently is shut down and the crew is relying on a Russian generator and stored air pending the return to Earth of a critical component that failed earlier. While a spare component has been installed in the U.S. system, engineers do not want to restart the oxygen generator until they know what caused the original problem. In the meantime, NASA plans to deliver additional oxygen with Discovery. Because of a variety of complex technical issues, the amount of oxygen Discovery can deliver to the station is directly related to when the shuttle takes off. And as far as the December opportunities, sooner is better than later. But developing a flight rationale that is acceptable to the community could push the mission into February depending on how the analysis plays out.